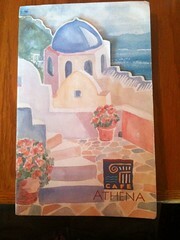 Dan and I went to dinner last night at Cafe Athena in Pacific Beach and had the best time. It was a short drive from home, parking was easy, and the atmosphere there is just right — comfortable and casual, but not sloppy. We sat at a little table in the window. The staff was great, especially our server. We started off with an appetizer of Yalandji, which was stuffed grape leaves with a filling of rice, fresh tomato, red pepper, onion, mint and pomegranate molasses. The flavor was amazing — tangy and fresh and zingy and just fabulous. Next time I might make a dinner of Yalandji alone! Then we had soup — tomato basil for Dan, and avgolemono for me. Yummy. Then Dan had the beef kabob and I had Papoutsakia, which was Italian eggplant filled with seasoned ground leg of lamb, onion and pine nuts. Topped with tomato sauce, fresh basil and Feta cheese and wrapped in a slab of pita bread. It tasted very good, though I would have preferred a higher veggie-to-meat ratio ;-) And by that time I was pretty full of appetizers and soup so I brought most of it home for lunch today. Looking forward to it. YUM. The restaurant wasn’t too crowded so we felt like we could relax and take our time, and we had a lovely long slow dinner with lots of fun conversation. It was a great evening! 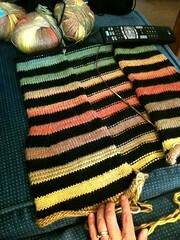 I’m working on two main knitting projects for the fair this year. The delivery deadline is May 25th, so it’s time to get cracking! Thing One is another striped Chroma vest like the one I designed and made for Mom, but with a few refinements to the pattern and some adjustments to fit me. I reached the underarms today, which means it’s time to plan out the steeks and the whole thing gets much narrower and moves along even faster, so I’m well over halfway finished with the main knitting. After that it’s just steeks and ribbing. Woohoo! Thing Two is a “Nerderdel” lace tired skirt. Just started it today as a reward for making such great progress on the vest. 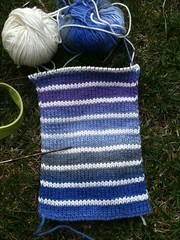 The yarn is knitpicks “cotlin” (cotton/linen blend). It’s made of Knitpicks’ “Chroma” and “Wool of the Andes” yarn. 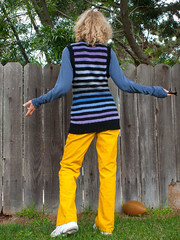 I worked it bottom-up and steeked the armholes so the stripes would be consistent. 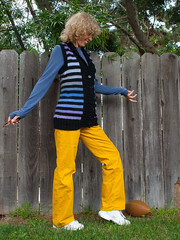 Crocheted steeks are MUCH more fun than sewn ones! I took it along to the North Coast Knitters Guild Knit-at-Night on Wednesday and it was much admired! 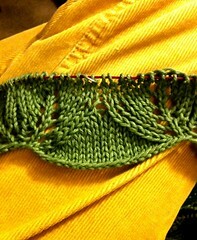 I love love love the Knit-at-Night. Everyone is so friendly and encouraging and warm. I really look forward to going every month.